Fall Sports Home Schedule 2016-2017 Come and support our Patriots! 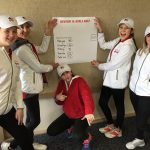 Monday, April 18, 2016 11:00 AM Place 1 Points 76 Meet Recap A beautiful day of golf and the sun was shining on the Lady Patriots as they got their first, 1st place victory of the season. Brooklyn Armstrong led the Patriots with 26 points over Maeser Prep Academy who finished a close 2nd place.